GLEANING OF THE FIELDS ("leḳeṭ"). The remains of a crop after harvesting, which must be left for the poor. The Mosaic law enjoins: "And when ye reap the harvest of your land, thou shalt not wholly reap the corners of thy field, neither shalt thou gather the gleanings of thy harvest. And thou shalt not glean thy vineyard, neither shalt thou gather every grape of thy vineyard; thou shalt leave them for the poor and the stranger: I am the Lord your God" (Lev. xix. 9, 10). "When thou beatest thine olive tree, thou shalt not go over the boughs again: it shall be for the stranger, for the fatherless, and for the widow. When thou gatherest the grapes of thy vineyard, thou shalt not glean it afterward: it shallbe for the stranger, for the fatherless, and for the widow" (Deut. xxiv. 20, 21). These provisions belong to the agricultural poor-laws of the Bible, the transgression of which was punishable with stripes. In the Book of Ruth there is a description of the manner in which the fields were gleaned. The poor followed the reapers at their work, and gathered all the remains of the crop, both those that fell out of the hands of the reaper and those that escaped the sickle (Ruth ii. 2). The Rabbis interpreted and limited this law in different ways. They made it applicable only to the cases enumerated in the Bible, namely, to corn-fields, orchards, and vineyards, and excepted vegetable gardens (Sifra, ad loc.). The master of the crop could derive no benefit from the gleanings (Ḥul. 131a; Maimonides, "Yad," Mattenot 'Aniyim, i. 8). He dared not discriminate among the poor; he might not even help one in gathering; nor could he hire a laborer on the condition that his son should be permitted to glean after him (Peah v. 6; "Yad," l.c. iv. 11). He who prevented the poor from coming into his field by keeping dogs or lions to frighten them away, or he who favored one poor man to the injury of another, was considered a robber of the poor. 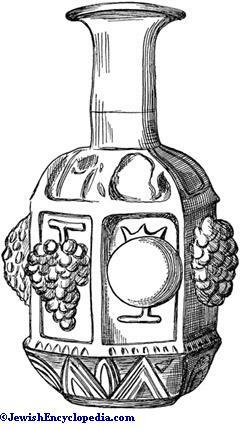 However, if there were no poor in the place, the proprietor was not obliged to seek them elsewhere, but might appropriate the gleanings to himself (Ḥul. 134b; "Yad," l.c. iv. 10). 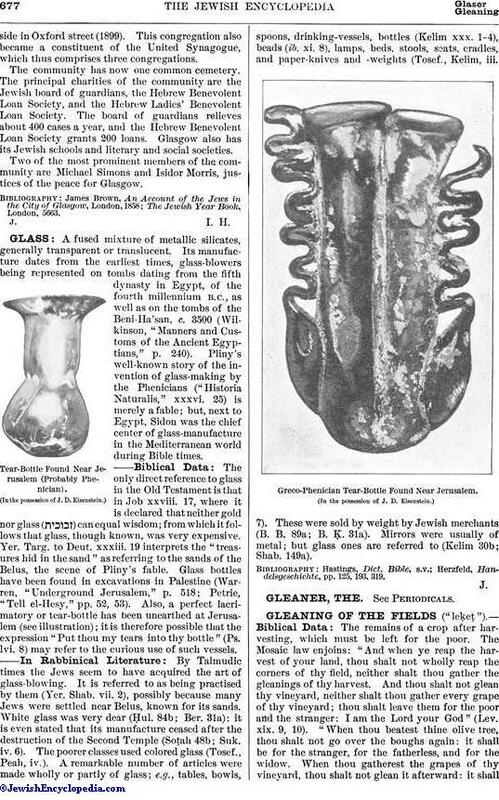 Glass Bottle Found in a Jewish Catacomb at Rome. Although the provision was made in the interest of the Jewish poor only, and such Gentiles as had adopted Judaism ("ger ẓedeḳ"), in order to establish peaceful relations among the various inhabitants of the land, the poor of other nations were permitted to glean together with the Jewish poor, no one being allowed to drive them away (Giṭ. 59b). This provision, as well as all other agrarian laws, was obligatory only in Palestine, as the expression "your land" indicates (Yer. Peah ii. 5). Still, many of the rabbis observed these laws even in Babylon (Ḥul. 134b; "Yad," l.c. i. 14). 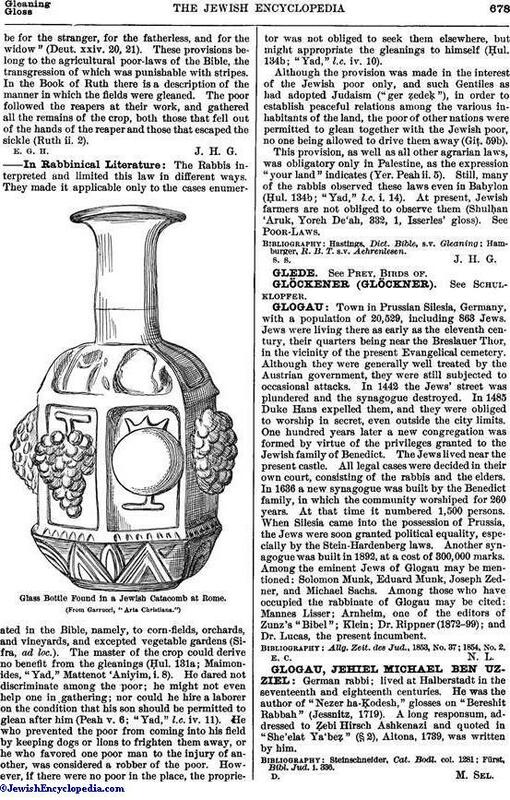 At present, Jewish farmers are not obliged to observe them (Shulḥan 'Aruk, Yoreh De'ah, 332, 1, Isserles' gloss). See Poor-Laws. Hamburger, R. B. T. s.v. Aehrenlesen.